Yehouda Chaki’s work is readily recognized for its exuberant brushwork and bold lines. 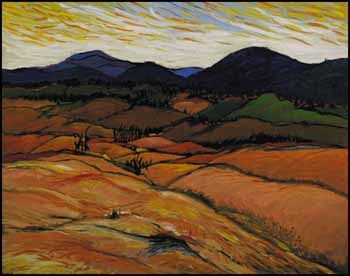 His landscapes and works in still life are vividly coloured and energetic, seeming to almost glow with hot colour. His use of black to outline, enhance, agitate and energize forms is a notable trait in his work. Chaki was born in Athens, raised in Israel and educated in Paris. He has lived in Montreal since coming to Canada in 1962. His expansive view of the world shows in his landscapes, which are universal in their geographic and topographic details - trees, fields, crops and valleys are from everywhere and nowhere. Sensual, dramatic, full of rich colour and layered rhythmic patterns, Chaki’s landscapes are emotionally charged and dynamic. Chaki was head of the department of Painting and Drawing in the Department of Fine Arts at the Saidye Bronfman Centre for the Arts in Montreal from 1967 until 1989, and is presently an advisor to the centre. He is considered an important and influential teacher.